For families who use cloth diapers, it can be difficult to find a diaper rash cream that is safe for cloth diapers and actually works to quickly heal sore skin. I'm happy to report that the Baby Balm from Reese and Luke is organic, natural, safe for cloth diapers, and effective in treating irritated and sensitive skin. Reese and Luke Baby Balm was created by cloth-diapering parents in Canada who weren't willing to settle for the other rash creams that were available on the market. Now Reese and Luke brand sells two baby skin care products: their Original Baby Balm and their Lavender Baby Balm. Both balms are certified USDA organic and are made with only recognizable and natural ingredients. 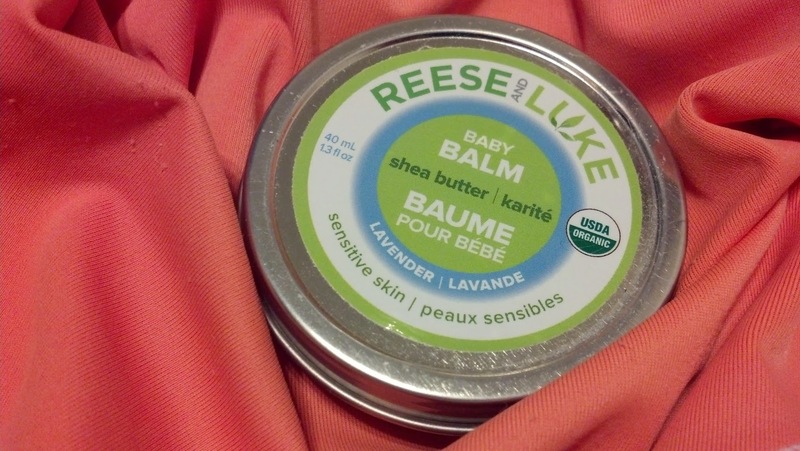 Read on for my full review and to see how safe and effective Reese and Luke Baby Balm can be! Reese and Luke is committed to selling a pure and natural product. In addition to being certified organic, Reese and Luke Balms include NO Synthetic Chemicals, NO Parabens, NO Petroleum By-Products, NO Artificial Fragrances, NO Artificial Colors, NO Sodium Sulfates, NO Formaldehydes, and they are not tested on animals. In short, parents can feel totally safe using these balms on their babies and children. This is a huge relief for me, as more and more studies are showing that many "typical" additives in skin-care products can be harmful to the body. It's so wonderful to see a product that is safe for our bodies. The Lavender Baby Balm from Reese and Luke comes in a 1.3 fl. oz. tin, which makes it convenient for keeping in the diaper bag. The Shea butter, olive oil, candelilla wax, jojoba oil, St. John's wort, calendula extract, and lavendin oil ingredients create a natural barrier against wetness, which allow sore and irritated skin a chance to heal. The balm is easy to smooth on with a finger and can be rubbed in nicely. The lavender scent is soothing and is a comforting addition to the balm. We used the Lavender Baby Balm from Reese and Luke on my 3-year-old daughter, who has recently been having some redness and discomfort in her feminine area. While she regularly uses the potty and wears underwear, I suspect the redness is caused by her inexperience in learning how to properly wipe (and gently wipe!) after using the potty. The Lavender Baby Balm really fit the bill for us, because the only products we feel comfortable using on my daughter's most sensitive parts need to be natural and filled with healing ingredients. Just knowing that we were going to use the balm helped my daughter feel calm. She loves creams and balms in general and became a big fan of the Reese and Luke Baby Balm, even requesting it when she could feel her skin getting sore again. The Baby Balm smoothed on easily and comforted her almost immediately. The scent of the Lavender Balm was nice and not too strong and I could not smell it later through her clothing. The rash cream worked very quickly and effectively. For example, if we put on the rash cream at night before bedtime, my daughter's redness and discomfort were gone by the next day. I call that a success! While the lavender balm comes in a tin, the Original Shea Butter Baby Balm comes in a 3.5 fl oz glass tub with a screw-on lid. I appreciate the screw-top because I feel like my kids are less likely to get into it (we've had rash cream nighttime escapades before!). The tub is a generous size and should last through many many diaper changes. I also wanted to mention that both the tub and the tin of Reese and Luke Baby Balm are available for purchase from Amazon, with the option of free two-day shipping for Amazon Prime members. What great service! If you cloth diaper, then you know the pain of having a well meaning babysitter or mother-in-law slather your baby's bum with regular rash cream. Not only does the typical rash cream contain chemicals and parabens, but they clog up and coat cloth diapers so that they don't absorb wetness well. (And these typical creams may stain your diapers, too boot.) Clogging up cloth diapers is particularly a problem for pocket diapers and microfleece users. The pores in the fleece get clogged up and liquids just roll off the surface instead of being absorbed by the insert below. The great news is the Reese and Luke Baby Balm is SAFE FOR CLOTH DIAPERS! Sorry for shouting, it's just really exciting for me! Cloth diapers will remain fully absorbent and will not be stained when you use Reese and Luke Baby Balm. Thank goodness! I tested out the Original Shea Butter Baby Balm on myself because the backs of my hands have been particularly dry, scaly, and bumpy lately. Scary, right? Most lotions haven't helped in the long run. I decided I needed some serious pampering and I turned to the Original Baby Balm. The scent of the Original Baby Balm is soothing, mild, and almost pine-ey to me. Approximately 15 minutes after applying the balm, I can't smell it at all on my hands. I consider this a plus. The balm is easy to swipe out of the jar with a finger and spreads nicely over my skin. In the beginning it felt a little greasy, but I kept rubbing it in and the feel became smooth and dry. I was not afraid to use electronics afterward or touch my face, etc. The backs of my hands felt immediately smoother and more moisturized, with an improved texture. I plan to continue to use the balm on my hands to keep my skin soft and to keep this strange new redness at bay. I'm confident it won't stand a chance against Reese and Luke Baby Balm! In conclusion, I definitely recommend Reese and Luke Baby Balm products. Not only are the balms made from natural and organic ingredients, but they are safe for cloth diapers, and really truly worked to cure my daughter's redness and irritation in her feminine area and also helped clear up the dry, bumpy skin on the back of my hands. I'm so happy to have these Balms from Reese and Luke in my home! Thanks for reading my Reese and Luke Baby Balm Review! We're having a giveaway for two tins of Reese and Luke Lavender Baby Balm from July 6th through July 23rd, 2014! Stop by and enter!